True to form, whenever we anchor out there is a thunderstorm late at night. But we survived and the rain did a good job of washing down the boat. Andrew arrived at 9:00AM with the RIB and he and I left for the 24 miles cruise to Celina. I was wrong on the mileage in my last post. Mavis stayed aboard the Katy Leigh. The river narrows at this point with high bluffs. One is called the Seven Sisters which has 7 rounded limestone overlooks high above the river. It was named by Daniel Boone. We got to Mile 381, the end of the navigable Cumberland in about 1.25 hours with the RIB going 21 mph. The Cumberland actually continues for another 78 miles to the Wolf Creek Dam on Lake Cumberland. 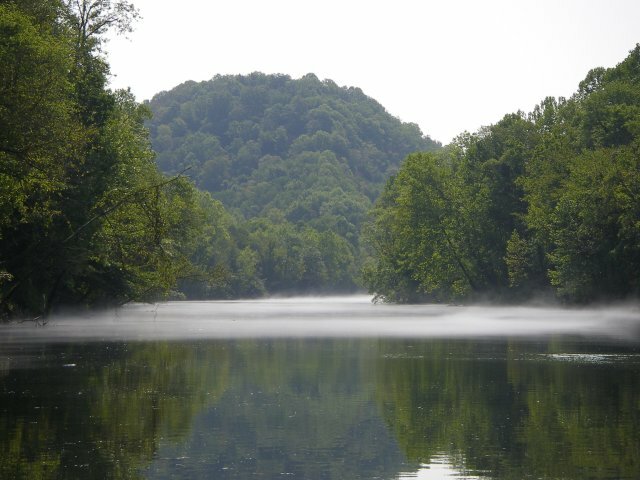 The Obey River is 7 miles long, drains Dale Hollow Lake and empties into the Cumberland at Celina. We went about a mile up the Obey to a boat ramp. The water was freezing cold in the Obey and there was fog on the water with the air temperature in the 90s. It was a strange sight. We were back at the Katy Leigh by noon, had lunch, pulled up the anchor, and cruised to Defeated Creek for dinner at the Creekview Restaurant and the Elvis concert. Another thunderstorm hit us tonight.